I won’t bang on about how I’ve neglected my blog (hangs head in shame), so I’ll get right into it. I made scones! And they turned out well, actually better than well, oh so yummy delish well. Best part about it was that it was so flipping easy. My dearest Wam always made scones that were light and fluffy and devoured as soon as they hit the table. I had asked her to send me her recipe, which is a newspaper clipping from waaaaay back when (I think the recipe calls them 17c scones). One Saturday morning I woke up with a desire to bake. I often just feel like baking, something about the measuring and waiting and joy of it working is very comforting. Opening the cupboards I found that I had both cream and strawberry jam and those two things immediately sent my salivary glands on fire. The brain screamed scones. I sifted through my recipes until I found the recipe I needed. The Wam’s words of “work quickly” and “use a knife to mix” stuck in my head and within about 20 mins the scones were in the oven. And the proof they say is in the pudding, scoffed down in a few minutes. 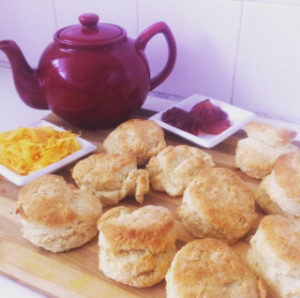 Happiness is a cuppa tea and freshly baked scones. This entry was posted in Eat and tagged bake, baking, homemade, recipe, yummy delish.